Introduction: Syndrome of neurapraxia of the cervical spinal cord with transient quadriplegia was first described by Torg et al. in 1986. 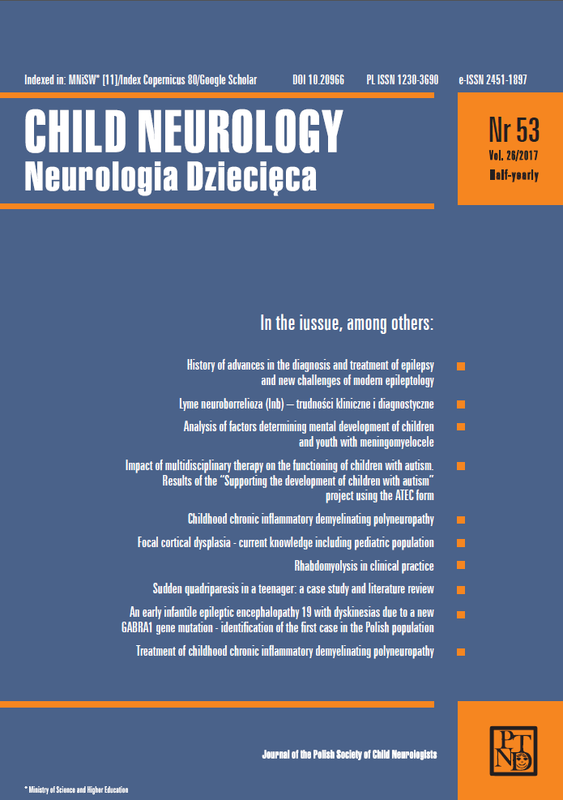 Cervical cord neurapraxia is defined as a transient neurological deficits following cervical cord trauma. Aim: In this paper we wanted to share our experience with a rare case of a sudden quadriparesis in paediatric population. Material and methods: The presented case involved a 17-year-old male intensively practicing strength and combat sports who suddenly suffered from quadriparesis with sensory disturbances. Symptoms developed 60 hours after a hyperextension head injury had taken place and subsided completely after 72 hours. Spinal magnetic resonance imaging demonstrated insidious disc changes with congenital cervical spinal stenosis without myelopathy. Disc changes within levels L4/L5 and L5/S1 with central disc protrusion L5/S1 with no central and foraminal stenosis were observed. Differential diagnosis of the case is also presented. Results: Taking into consideration the patient’s intense boxing and sparring practice with exposure to head and neck injuries and cervical spinal stenosis, sports-related cervical neurapraxia with transient quadriparesis was diagnosed. Conclusions: Cervical cord neurapraxia is a common consequence of sports-related injury, which should be considered in differential diagnosis, especially in athletes. Key words: quadriparesis, cervical spinal stenosis (CSS), cervical cord neurapraxia (CCN), spinal cord injury (SCI), magnetic resonance imaging (MRI). Słowa kluczowe: niedowład czterokończynowy, zwężenie odcinka szyjnego kanału kręgowego, neurapraksja odcinka szyjnego rdzenia kręgowego, uraz rdzenia kręgowego, rezonans magnetyczny.